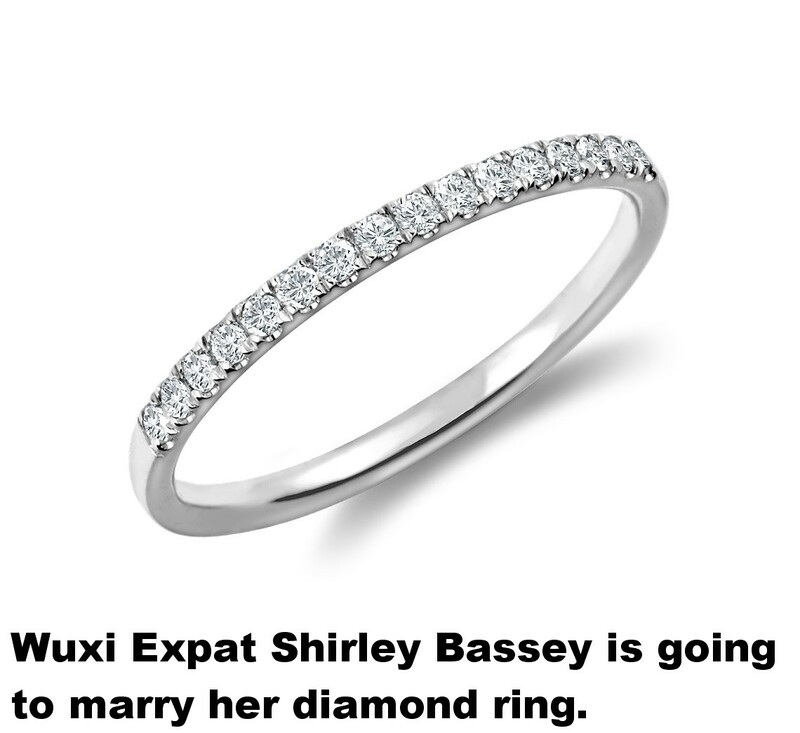 Lieutenant Shirley Bassey, traffic officer and the lead singer of the Wuxi China Expatdom Police Force, is going to marry her diamond ring named "PC." Thursday Afternoon, she visited the Wuxi China Expatdom Wedding License to submit her application, before she was to work her evening shift, singing and monitoring pedestrian traffic on Wuxi’s Nanchang Jie Bar Street. Bassey first meet PC, the .15 carat Petite Cathedral Diamond Ring in 18k White Gold with Average color of I, Average clarity S12, and16 rounds in a Pave Setting, when proposed to by her former husband. "My former husband, Thor Lyndon, was a bit of dud, but I never fell out of love with my darling Petite Cathedral, more affectionately known to me as "PC!"" said Bassey. Asked why she was going to marry a diamond ring Bassey said ""Diamonds are forever. They are all I need to please me. They can stimulate and please me! I like to Hold one up and then caress it. I like touch it, stroke it and undress it. I love to watch it sparkle around my finger! They always luster on!" Asked if she would ever marry a man again, Bassey, in no uncertain terms said she would not. Said Bassey: "Unlike men, Diamonds won’t leave in the night. I’ve no fear that "PC" will desert me! I don’t need the love of a man! What good would it do me? Men are mere mortals who are not worth going to your grave for! Yes! Diamonds are forever! Diamonds are forever! Diamonds are forever!" The Wuxi China Expatdom permits human being — inanimate object marriage.